Not this past Monday, but the one before, I managed to get our bikes and us ready on time to take Mal to preschool on the bike. It's only a few blocks away, so not a long ride at all, but there are some decent hills on the ride. Upon getting home I realized my wrist was hurting. Such things happen sometimes, so I did my best to ignore it. It continued to hurt the next day and the next. This worried me a bit, especially as Wednesday was a rehearsal day. Oddly enough, my wrist didn't bother me so much at rehearsal, but I had a mild amount of pain through my forearm and at my elbow. As soon as rehearsal was over the elbow pain was gone and I was back to just the wrist pain and some continued radiation of pain through my arm. Thursday I got the boys ready for school (Gareth's first day) and informed Gareth that we wouldn't ride as I was hoping to get my arm better by giving it as much of a break as possible. No biking, no more computer games, no pickup up Mal, and continuing my latest trend of minimal practicing. I got him off to school and then headed off to brunch with the co-op parents. By the time I parked I realized my hand felt somewhat numb - like it had fallen asleep. 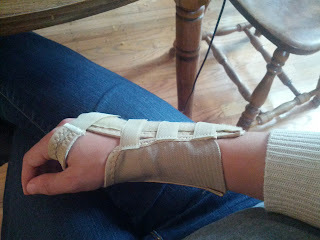 That continued through the next couple days and the wrist pain worsened. Usually a dull ache, but if I tried to grasp anything the pain would sharpen. Friday I was in so much pain I finally called the doctor and scheduled the earliest available appointment - almost a week later. Of course, by the time this Wednesday rolled around my arm was feeling much better. Still a small amount of wrist pain, but no more tingling hand and no more arm pain. Small amount of elbow pain at rehearsal, but none by the second half. I woke up on Thursday feeling much the same. Figures that things are improving by the time you get into the doctor! But I went anyway, just to see if they might know the cause and help with the small amount of pain remaining. The doctor has decided it's likely carpal tunnel. Not textbook, but the couple quick tests she did indicate that it's likely. So now I get to add a lovely fashion accessory to my closet - the wrist brace - and do some physical therapy. I'm not 100% sold on the brace idea. Sometimes it feels as though the brace is creating pain that wasn't previously there or causing pain that had gone away for those couple days to return. But at other points it does seem helpful. So I don't know. I'm more hopeful that the physical therapy will be helpful when I get that started - the first available appointment wasn't for a couple of weeks.